St. Patrick's Parade, Castlebar, 2016. Anyone interested in entering a float, band, marching group need to contact the organizers as soon as possible in order to register your interest and to guarantee your slot. Any schools that may not have a band but would like to march in the parade can do so too. Beidh fáilte roimh chuile dhuine! We will provide costumes on the day that we will give to schools and they can then march with a school banner at the front. Spaces are limited - so make contact immediately. Déan teagmháil linn anois! Email: chamber@castlebar.ie. 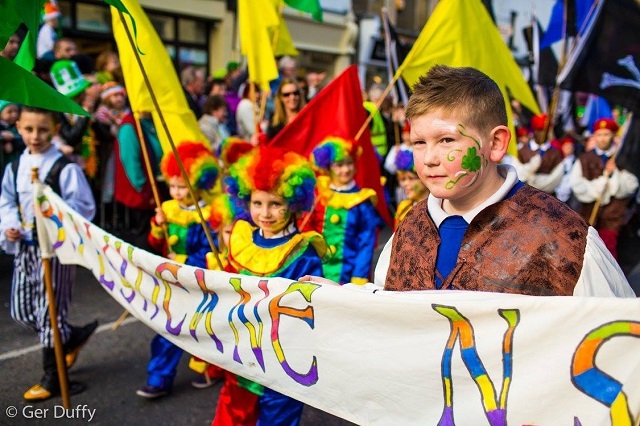 The Parade takes place on Sunday, March 20th @ 2.30pm. Don't forget, the theme this year is: Éire, 1916-2016.